It is advisable that you need to read the discussion first before you take the quiz for you to have a better understanding of the topic. Have you got any pens? I've got a few dollars. I haven't got many pens. There is one person here. There are three people here. I've got a little money. I haven't got much rice. Uncountable nouns are also called "mass nouns". 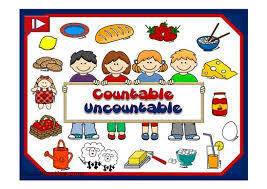 When you learn a new word, it's a good idea to learn whether it's countable or uncountable. Sometimes, the same noun can be countable and uncountable, often with a change of meaning. There are two hairs in my coffee! I don't have much hair. There are two lights in our bedroom. Close the curtain. There's too much light! Shhhhh! I thought I heard a noise. There are so many different noises in the city. It's difficult to work when there is so much noise. Hand me those student papers. I want to draw a picture. Have you got some paper? Our house has seven rooms. Is there room for me to sit here? We had a great time at the party. How many times have I told you no? Macbethis one of Shakespeare's greatest works. I have no money. I need work! Two teas and one coffee please. To count or quantify an uncountable noun we use a unit of measurement - a measure word. For example, we cannot usually say “two breads” because “bread” is uncountable. So, if we want to specify a quantity of bread we use a measure word such as “loaf” or “slice” in a structure like “two loaves of bread” or “two slices of bread”. We call this structure a partitive structure. We can use the same uncountable noun in different partitive expressions with different meanings. For example, a loaf of bread and a slice of bread are partitive expressions with different meanings. A loaf of bread is what we call a whole unit of bread that we buy from a baker. A slice of bread is what we call a smaller unit of bread after it has been cut from a loaf. Don't forget to buy a bag of rice when you go shopping. Can I have one cup of coffee and two cups of tea. The police found some items of clothing scattered around the floor. I need a truck that will take at least three pieces of furniture. You'd think a tablespoon of honey would be more than enough. The word "partitive" indicates that only "part" of a whole is being referred to. The partitive structure using a measure word is common with uncountable nouns, but it can also be used with countable nouns, for example: a series of accidents, two boxes of matches, a can of worms. You are now going to watch a video discussion of the topic before you can take the quiz. You are now ready to take the test. Good luck! Whether you use this reviewer or not as your key to pass the exam, the most important thing you need to do before taking any examinations is to prepare yourself, be healthy and study harder beforehand. Yes, you can always rely on your schema but as the lines says, “An ounce of prevention is better than a pound of cure.” Thank you very much! Something about the Author: Mr. Roe S. Riofriohas been teaching at Mandaluyong High School since November 2009. He teaches English to Grade 7 students. He is also currently taking his Masters Degree in Instructional Technology at Rizal Technological University, Mandaluyong. He would also like to thank his Professor in Advance Instructional Techmology, Prof. Jensen dg. Mañebog and his classmates for the support and motivation for him to finish this online reviewer. May God bless us always! Note: If this quiz is assigned to you by your teacher (or school), 'print screen' and print your score/result after taking this exam/reviewer, and submit it to your school authority. After answering this quiz, share it to your friends by clicking the SHARE button below. You may also want to leave a remark using the comment section below. Tag: AN INTERACTIVE QUIZ ON COUNTABLE AND UNCOUNTABLE NOUNS.